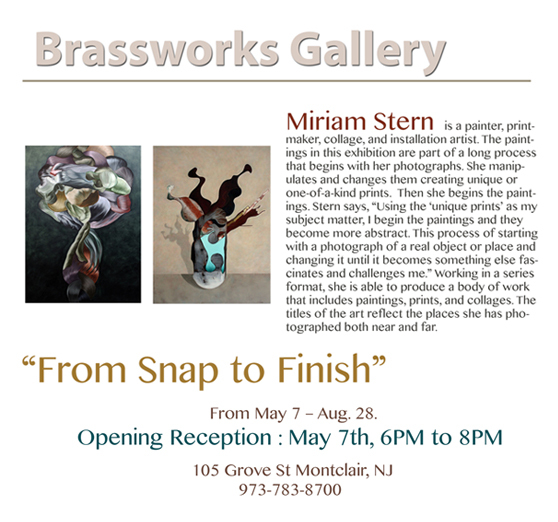 Miriam Stern is participating in a two person exhibition which will open for the 2nd time at Sunday June 7, 2015 from 1-3 PM. (Original opening was May 7th). The Brassworks Gallery, 105 Grove St. Montclair, NJ from 6-8PM. The show continues through Aug. 28 and is open from Mon-Fri from 9AM – 6PM. The show is called From Snap to Finish and refers to the fact that both artists begin their work with photography and end up with something entirely different, in Stern’s case paintings.